From here you can find the different tabs for the HomepageGrid, Form, and SubGrid. 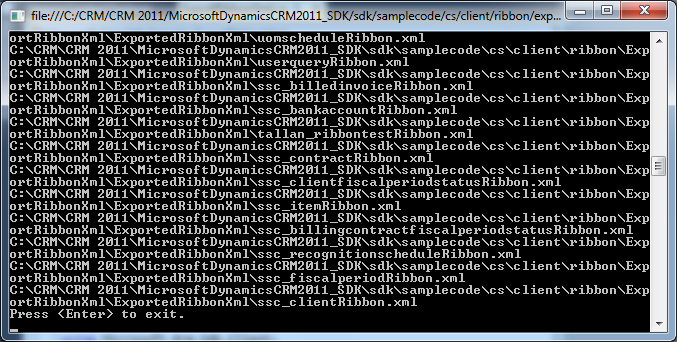 In my case, I have opened the .xml file for tallan_ribbontest. Note that you cannot modify the ribbon by changing this file. Now you have to locate the necessary control for the tab that you want to add or remove a button to. In this example I am going to add a button to the Data group on the Main tab of the Form. Now that we have the control, we can add the button to our Ribbon. 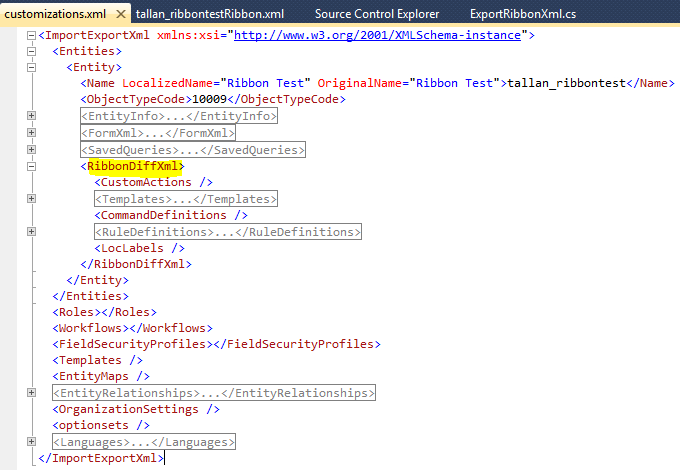 Create a CRM Solution with the single entity whose ribbon you want to customize. 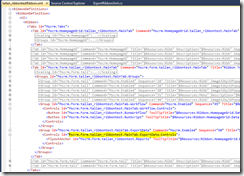 Export it as unmanaged and open the customizations.xml file. 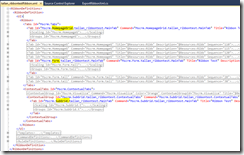 You can use any xml editor to modify it. In my case I am using Visual Studio. 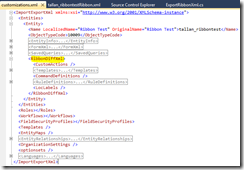 Search for <RibbonDiffXml>. This is where we will be making most of our modifications. Under the <RibbonDiffXml> node, we will modify the <CustomActions /> node to add the button. 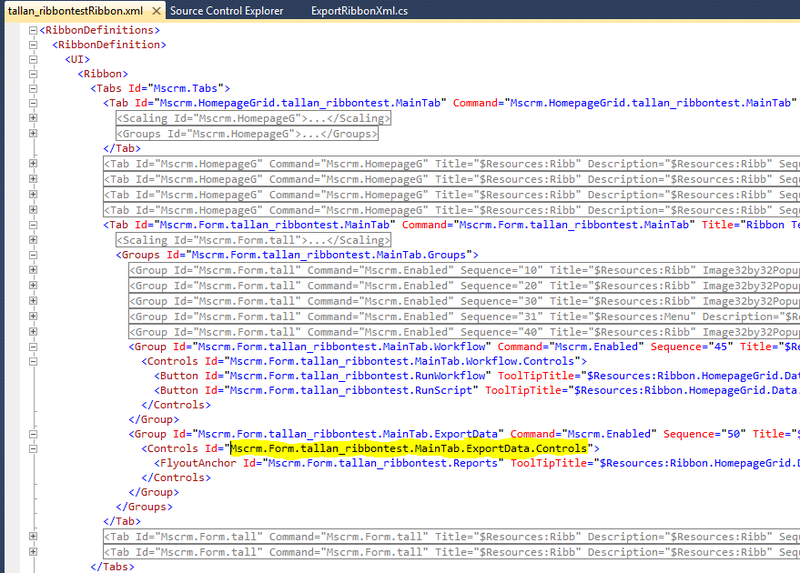 The Location tag is defined as the Control that we found above, followed by “._children“. This can be changed based on any control tag. Be sure not to forget to close the CustomActions node. After we have added the button and the command, save the customizations.xml file, add it back to your solution.zip file, and import it into your organization. Once your customizations are published, you will be able to see the new button in the ribbon. Hiding a ribbon button is actually easier than adding a button. Removing a button has two parts. The first part is finding the Button Id that you want to hide, and the second part is adding the action to hide that button. In this example we are going to hide the “Save” Button from the Form. Find the button that you want to remove. We can see that this is the correct button because it is under the Form, it is the MainTab, it is under the Groups node instead of the Scaling node, and the button ID has the correct description. 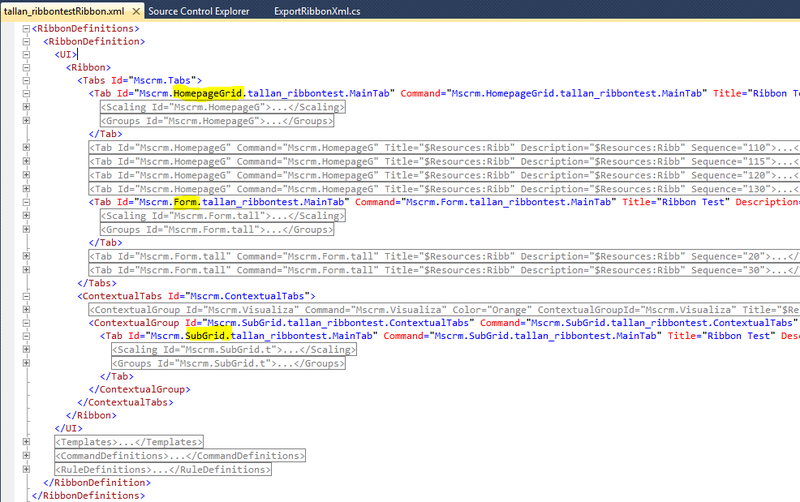 Now we go back to the customizations.xml file from above, and we add the following line to the CustomActions section. Save the customization.xml file, add it back to your solution.zip file, import it back into the system, and publish the customizations.